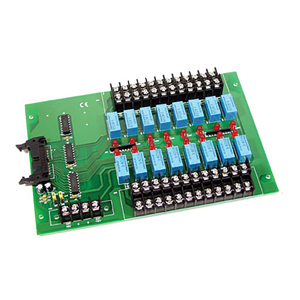 The OME-DB-16R 16-channel relay output board consists of 16 form C relays for efficient switching of loads by programmed control. The relays are energized by applying 5 V signal to the appropriate relay channel on the 20-pin flat cable connector. Sixteen LED’s (one for each relay) light when their associated relay is activated. To avoid overloading your PC’s power supply, this board provides a screw terminal connection for a power supply. The OME-DB-16R can be used with any of the listed compatible data acquisition boards or with other devices. When using the OME-DB-16R with any of the compatible data acquisition boards, the +5V and +12V are supplied from the 20-pin flat cable (no external power supplies required). In this case, the JP1 and JP2 jumpers on the OME-DB-16R are set to internal (factory default). When using the OME-DB-16R with some other device, then either internal or external power can be used. If external power supplies are used, then jumpers JP1 and JP2 on the OME-DB-16R would be set to external.